When I look back on my life, I can say it had all been pretty planned out. Once you graduate from high school, you go to college. After college, I ended up getting married and moving a bunch of times. I had predictable jobs that fit my marketing degree & lived the life that I always thought I would have. You could say it was pretty smooth sailing. I always felt that God had a plan for me…and everything always happened for a reason. I had never experienced the feeling of my world being turned upside down over night. 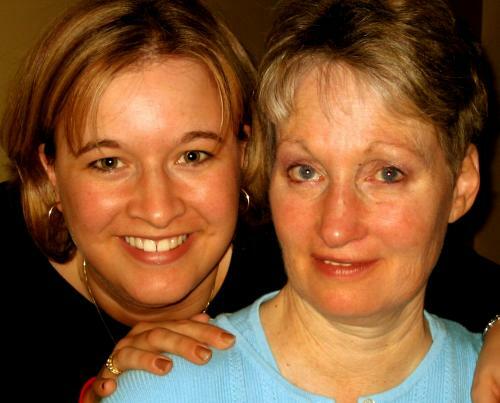 Once my mom was given her ALS diagnosis, things began to change very quickly. I became addicted to calling home and seeing how things were going (I was living in Boston at the time). My mom had officially left her job at Nordstrom (which she loved) and was now cooped up in the house more than she would like. My dad had taken on an enthusiastic endeavor of learning everything about ALS he could and possible homeopathic therapies that can help. He had to continue going to work as well, and he never found time to rest. I felt completely helpless. I kept hearing about little things that were happening, like random falls or not being able to get up off of the couch after being seated. Eventually, I was being told that my mom was having a hard time feeding herself. This was tough to hear. I wanted to come home. My dad had told me to wait until things got really bad when I kept asking if I should come home for a visit. Eventually, I just said I was coming….and he said ok. He sounded relieved. I told the company that I worked for that I needed to go home for a month. They were kind enough to hold my job for me & I headed home. I remember when I told my sister (who was attending school at the University of Kansas) she got upset. I assured her that I wasn’t going home because they couldn’t make it without me. In my heart I didn’t know if that was the truth, but I have always felt a need to protect Jenna. I didn’t want her to get upset and worry while she was at school. I told her that I was going home to check out the situation & I felt that I just needed to be with mom & dad. I think that she was happy I was going home too. We were all so confused with how to handle our new situation. Our emotions were all over the place & who knows what stages of coping we were all at. I think we were all at different places. 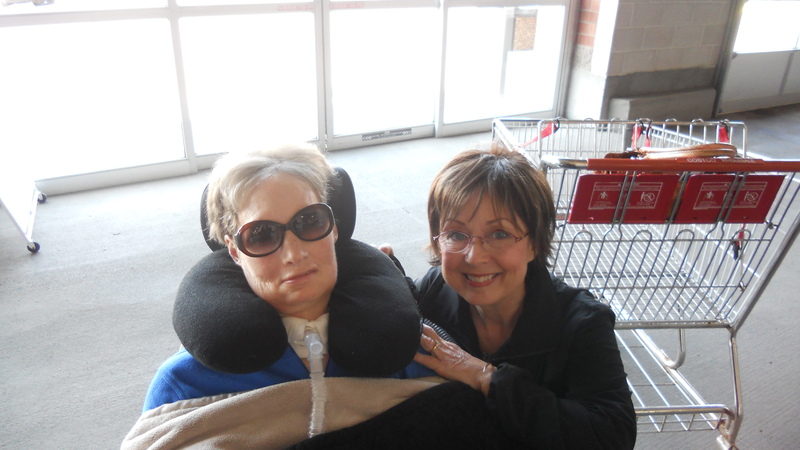 The day that I came home, I will always remember the look of relief & excitement on my mom’s face. 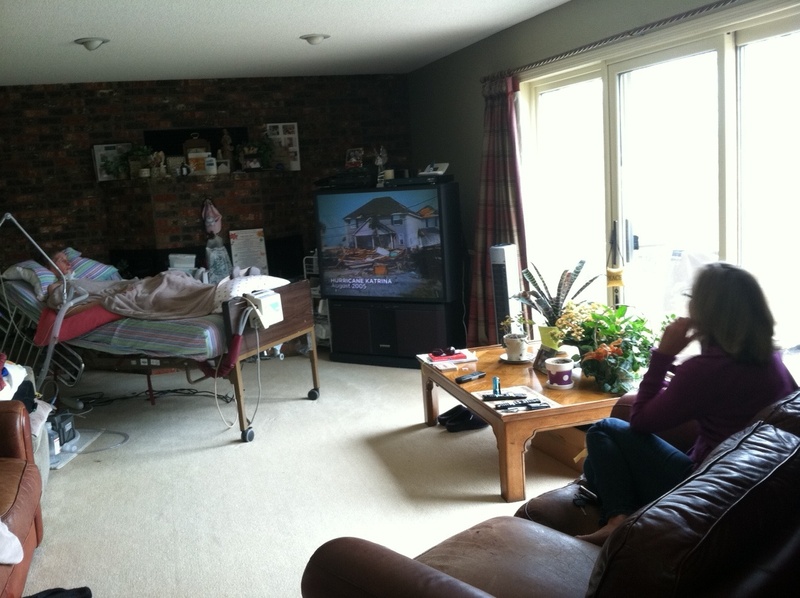 She was sitting in the corner of the family room in her lift chair on the phone (of course) with her legs tucked up. She looked so cute like there was nothing wrong with her. How could this amazing woman be sick? She got off the phone & I gave her a huge hug. I was so excited to be with her too. How would I ever be able to leave her again? This woman just meant way too much to me. Over the next month, my mom and I spent every day together. We both (with my dad) mentally got used to what ALS was. We accepted the fact that a walker was necessary. Little steps such as this were hard to accept. You hate accepting the fact that you are getting worse. But compromising safety is far more dangerous, and we had our falls (which we would try to laugh through). I would feed my mom every meal. One bite for her, one for me. It didn’t even bother me. And she handled it like a trooper. 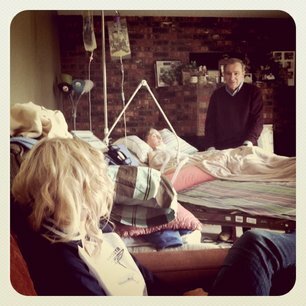 We had many of her friends over, like we do now & they would bring organic meals & we would chat our afternoons away. After spending a couple of weeks at home, I knew this would have to be a permanent choice for me. 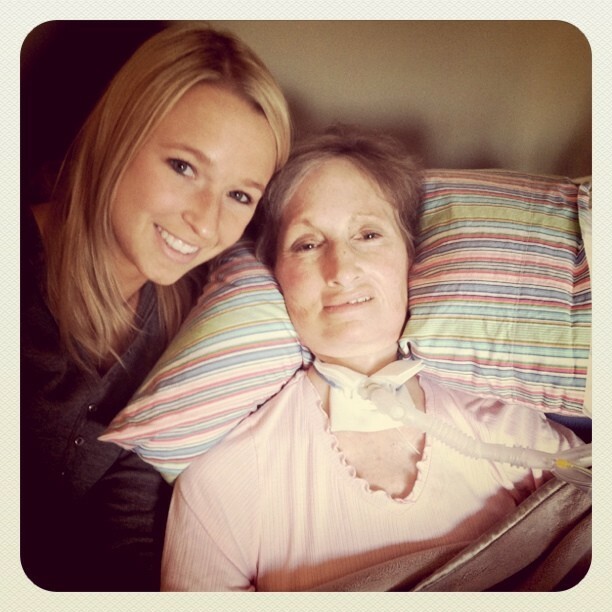 If this disease was going to do this to my mom, then I had to be with her. 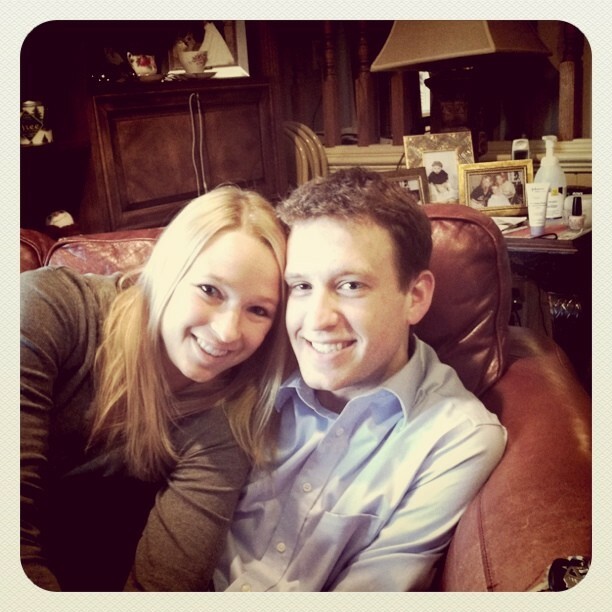 My husband at the time & I were growing apart….so I made the choice to move back home with my family. (of course there was a lot more behind the scenes than that….but I won’t go into it). Shortly after I moved back home, my sister decided to transfer to the University of Minnesota when her semester was done. My parents went from “empty nesters” to having 2 of their 3 children back home. We wish it could have been under better circumstances, but I know that it made my mom happy. 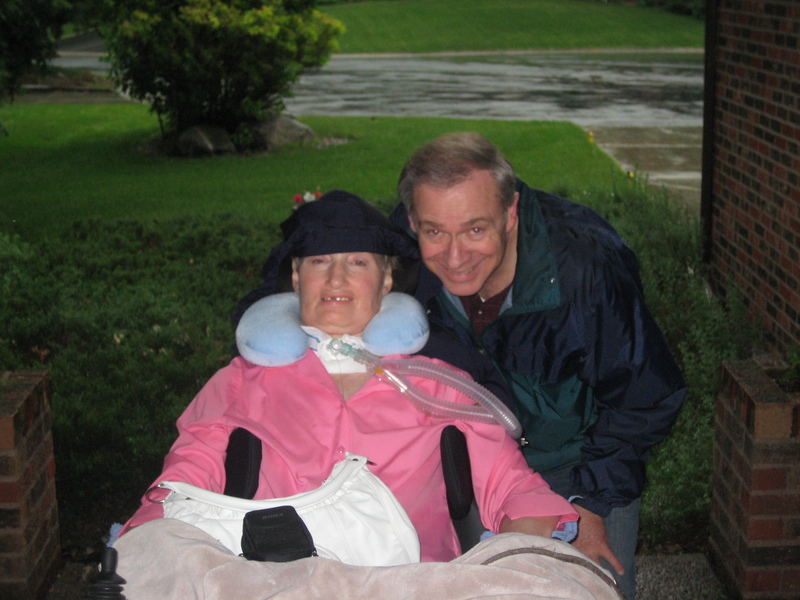 If you talk to any family that has had a member with ALS, you will hear about sacrifices that had to be made. There is just no other way. In fact, I could write a whole story about going from being an independent working woman with her own home that moves back home with her family & the struggle to be a respectful daughter yet still be an independent adult. haha. That was probably the hardest adjustment. But in the end, we are a very close family that has travelled a very long a challenging road together to find what our new sense of “normal” is now. We were very pleased to wake up to such a beautiful day here in MN! He has risen, and he is shining his light down upon us! Last night we went to the Swarm game and had a great time as usual. The Xcel was packed & the energy was amazing. Jenna was “Girl of the Game” and I was able to catch a picture of her on the jumbo-tron. Is that even how you spell it? The Swarm managed to pull off an exciting win & we will be having a home playoff game next Saturday!! We will be there! Today we cooled our jets & relaxed a bit before having Jenna & Ross over. My brother was working today, so his kiddos spent Easter with Souvanny’s family. It gets tough to drive back and forth because they live in Brooklyn Center which is just far enough away to make it inconvenient. It has been a bit since we have seen his boys…..and I am really starting to miss them!!! Hopefully we can get something together soon. My brother is getting a ton of hours at work, which is a good thing, but makes our visits few and far between. So, tonight we grilled a huge meal with my mom, dad, Jenna & Ross, and are now completely exhausted and stuffed. I hope that everybody else out there had a wonderful day with their families. I have enjoyed seeing everybody’s fun pictures on Facebook! I especially love seeing the kiddies in their cute outfits/church wear. It doesn’t get any better than that! here are a couple of picture from our crazy family! Thank you everybody for checking in with us! Happy Easter! Prayer for Julie: Pray for continued peace from her skin sensations. She has still been doing pretty well. Another pretty good week here in good old Eden Prairie. The weather has been HORRIBLE…..but we are used to that by now. I think the highlights were shopping at Target on Monday, we grilled as a family on Tuesday & I got my night off, Wednesday my mom & I read a bunch & today was filled with visitors and gabbing. The perfect combination for us! When Amy came over today she said that we would have to watch Oprah today at 4:00 because it was about best friends (Oprah & Gayle) and everybody in the audience would be with their best friends. Amy said that she came over to watch it with her best friend Julie. How cute is that? 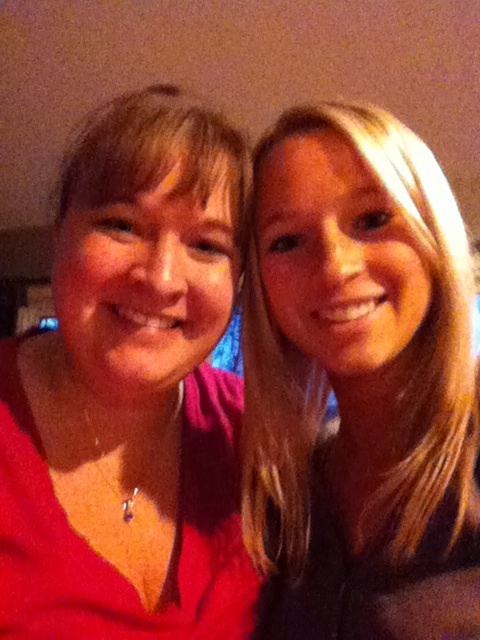 Amy and my mom have had such a special friendship since before I can even remember. They would often go for walks and my mom would never come home. My dad would send me to go and find my mom….and they would be sitting on the curb chatting away. How they could have so much to talk about..I will never know. Since my mom has been sick, Amy comes to see her every week without fail. My mom has other AMAZING friends as well, and I know that it is all these friendships that keep her chugging along. My mom would never turn away a visitor saying that she needs “to rest”. That would simply kill her. She loves her friendships & family more than anything. On the friendship idea, I have some AMAZING best friends as well. 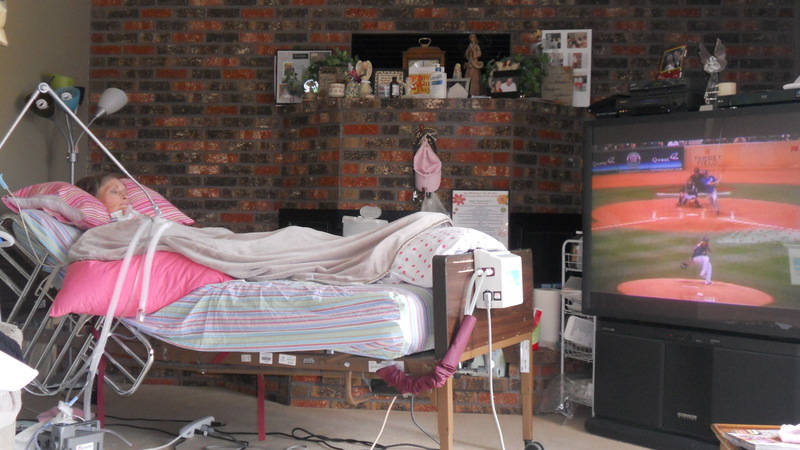 I have been so thankful to the friends I have, and how they have been at my side through every step of the ALS process. I probably don’t tell them thank you enough. I know that my sister feels the same way with her friends. It only takes those 1 or 2 or 3 or 4 special people who can help you start to see that little light when things can seem so bleak. I have had those times, though they may have been very long ago. Thank you friends! You know who you are!!!!! Okay, that is enough of the mushy stuff. I guess that I was feeling sentimental. Tomorrow my mom and I are going to see “Water for Elephants” with my Godmother for her Birthday. It is one of our favorite books so we are really excited! It is also the last Swarm game of the season on Saturday….so you will get to stop hearing me talk about it all of the time! haha. If you like my Blog, please find our page on Facebook & click the “like” button. Just search “ALS changed my life”. Thank you so much for the support! 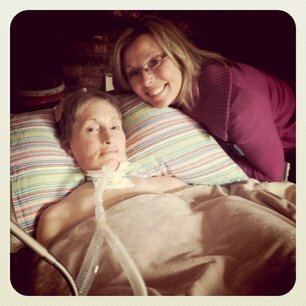 Prayer for Julie: Sensations are doing SO MUCH better. Please keep praying for continued peace from the strange sensations on her body. Happy Sunday Everybody! The Sun is shining & our spirits are soaring! Can you feel my optimism? haha. The snow from yesterday (yes SNOW) has disappeared and hopefully it was our last. My dad talked to his dad this morning (he lives in upper Michigan) and apparently they got 3 inches and it is still coming down. CRAZY!! Yesterday was the second to last Swarm home game of the season. It was also a game dedicated to Breast Cancer Awareness/research……so they were doing all sorts of fun things to raise money for a cure. Jenna had a great group of people come to watch again! Thank you to all of her friends that came to support her & the Swarm. It was fun seeing all of you! Thank you also to my bestie Dana for coming! Dana has always supported Jenna through her dancing years & I love her for it! Godmother Mary was there again & it just wouldn’t be the same without her! I love how she knows all of our friends & they love her as much as we do!!! Here are some pics! As you can see…..we had a great time! There is still a slight possibility that there could be a home playoff game so we are keeping our fingers crossed! That is all for now! As always, thank you for checking in!!!!! That is right. Now that the Minnesota Twins are back in full swing…my mom has yet another thing to hold her attention (along with the amazing weather we have been having). I am hoping to get her to a game this year since we have such an amazing new ball park. I always love any sort of activity that puts a smile on her face and gives her enjoyment. (Even though they haven’t been playing that great as of yet. Come on Twins!). Today was a great day. We started off with a visit from our friend Joey. Then Catey came over to help us around the house. Jenna stopped over & so did our friend Amy. Lots of chatting and catching up. My mom has been dealing with some of her “skin sensations” today, but they have calmed down within the last couple of hours. 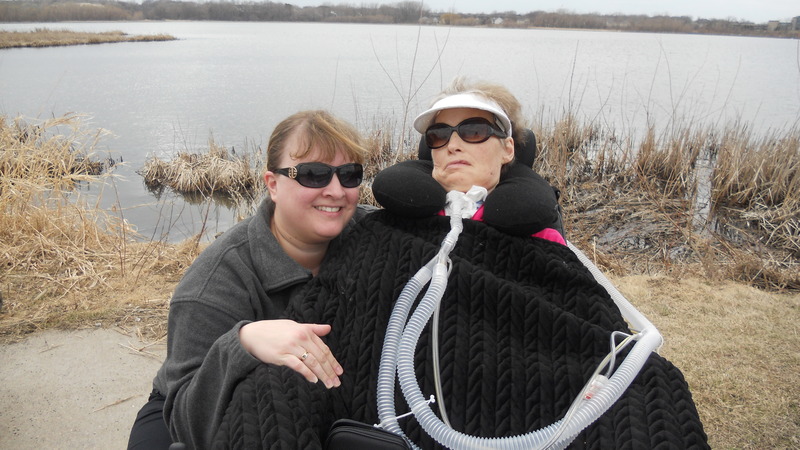 We have scheduled an appointment with her ALS neurologist coming up to see if anything can be done. They are more driving her crazy than anything. I would think of it as an itch you can’t scratch. Not really causing you pain….but driving you absolutely crazy. I would do anything to make it go away! The days that we are able to get outside we have a great time. We have gone for several walks & ran many errands. We have a bit of a cold front coming into town for now….but we won’t get down about that. We know it will move right on through! Jenna has her second to last Swarm Game this weekend. We will be attending of course! They say we might be getting snow that day. I think they are crazy! We will miss the games when the Swarm season is over. We have really enjoyed having such a fun thing to go and do. Jenna’s friends, family and co-workers have been so great about coming to cheer her on. I know she is very grateful! 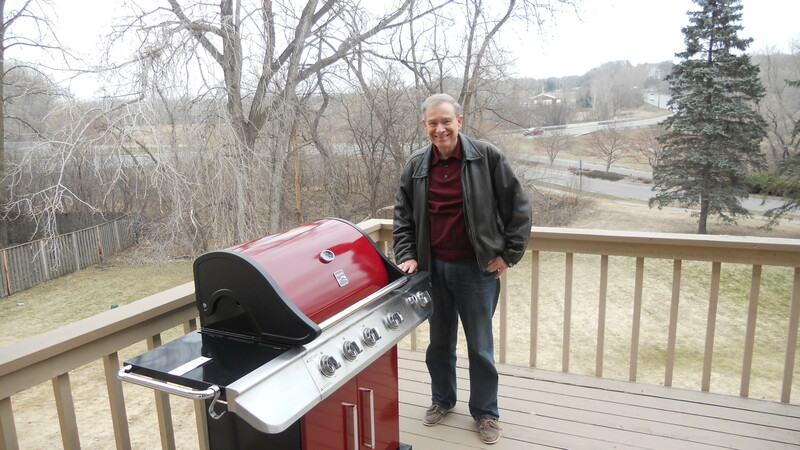 On a final note, my dad bought a new grill this week. He is so excited…..so I had to snap a picture! I know that our family members from the Kast side of the family will be happy. When we would have family BBQ’s over here….they would all laugh at our poor excuse for a grill that we had before. Oh, the small pleasures in life. OK my friends….that is all for now. My evening break is about to begin! Prayer for Julie: Prayer that we find the answer to these crazy skin sensations. Yes! That time of year is finally here! My mom and I just got back from walking with baby J. We walked both today and yesterday. I snapped a couple of pics. The sun was shining bright for most of the walk & then took a turn at the end when I snapped these. Looks like we got out just in time! We also ran into Jenna’s friend Aimee! She was one of Jenna’s bridesmaids & they are great buddies. Now we are all tucked back in bed and watching the Twin’s season home opener. Jenna & Ross are off to Ross’ cabin. It is not often that their schedules allow them to do that, so we are happy for them. Mom’s “sensations” have been ok so far today. Cross your fingers. The prayers must be working! It might not be green yet...but we are outside! 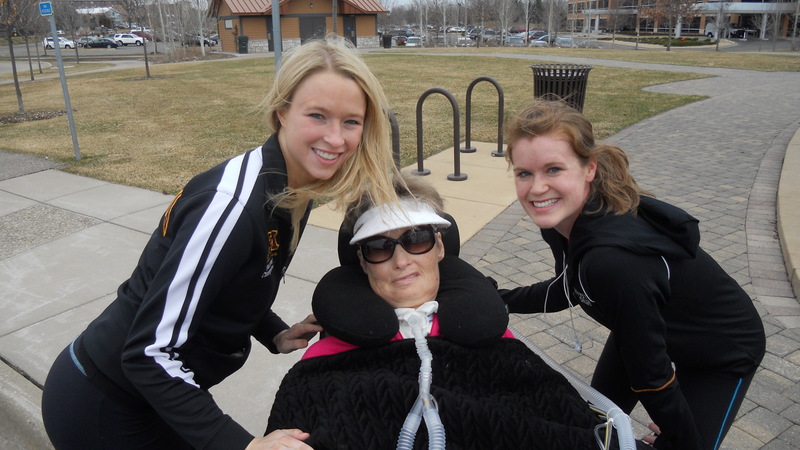 Jenna, Mom & Aimee. I just love that smile! Ok, just wanted to post those really quick! Happy weekend everybody! The last week or so has had its ups and downs for us. We have had some amazingly fun moments….and some emotionally draining moments. I ask everybody to continue praying for my mom’s “sensations” in her skin. 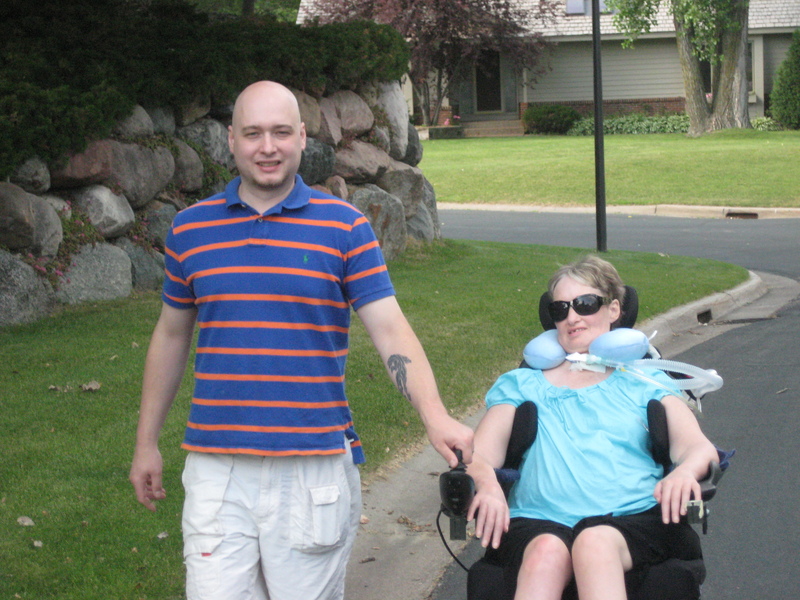 We are making an appointment with her neurologist to see if these feelings are something common in ALS patients. We have also cut back her dosage of Ativan thinking it could be a possible side effect or withdrawal symptom. After going through her medications….my sister & I realized that she didn’t even necessarily need to be on that med every day. So after gradually backing down her dosage….things have gotten a little better. We hope that this will continue to head in the right direction! Some highlights from last week: Hanging out with friends (of course). We had a fun lunch date with our friends Amy, Cheryl & Jenna last Thursday at D’Brians. A family favorite! 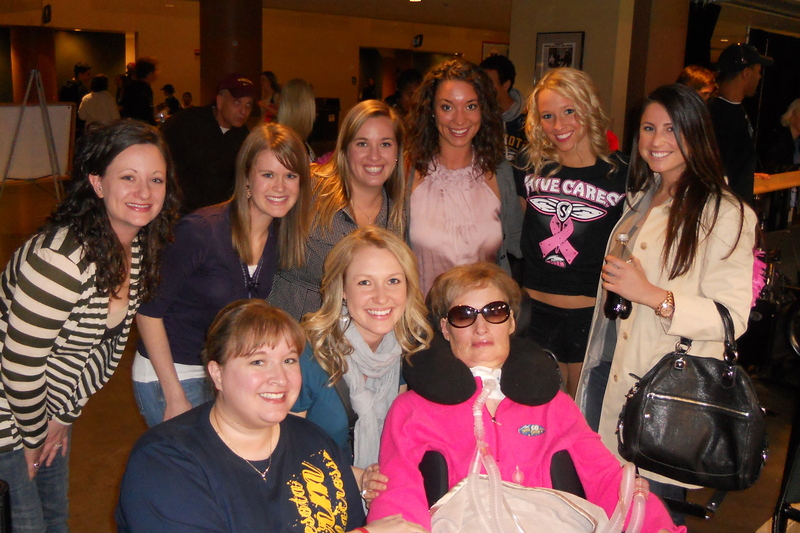 Jenna also had a Swarm game on Saturday that we went to with my Godmother Mary. She loves sports…so it is always fun to go with her! The Swarm won & made it to the playoffs. Yes! There are 2 more home games of the regular season left & we will be at them both! Jenna was also “girl of the week”. Here is the link to her interview if you are interested in checking it out. Jenna Swarm Interview. Yesterday my mom and I went to Costco. The day was so spectacular. You couldn’t help but smile. We ran into our friend Yvonne while we were there. We don’t get to see her very often, so it was great to catch up! She said that she was actually going to try to come to our house that day. Life can be ironic. Here is a picture that I was able to snap of the ladies. Jenna came to give me the night off yesterday & that brings us to today! I had my yearly check-up for myself this morning. It is weird going to the doctor for myself when I am always going for my mom. I am sure that all the mothers out there know how I feel. I am glad that I make sure to go every year though. Having a hard time finding veins in my mom doesn’t stop with her. They have an impossible time with me as well. So after several pokes & prodding….they finally got the blood they were after. At least I didn’t faint this time! In honor of spring….I am going to post a few pictures from last summer. They make me happy!